From Goodreads: Tom Angleberger's latest, loopiest middle-grade novel begins when M'Lady Luggertuck loosens her corset (it's never been loosened before! ), thereby setting off a chain of events in which all the strict rules of Smugwick Manor are abandoned. When, as a result of "the Loosening," the precious family heirloom, the Luggertuck Lump (quite literally a lump), goes missing, the Luggertucks look for someone to blame. Is it Horton Halfpott, the good-natured but lowly kitchen boy who can't tell a lie? Or one of the many colorful cast members in this silly romp of a mystery. Opening Lines: "There are so many exciting things in this book--a Stolen Diamond, snooping stable boys, a famous detective, the disappearance of a Valuable Wig, love, pickle eclairs, unbridled Evil, and the Black Deeds of the Shipless Pirates--that it really does seem a shame to begin with ladies' underwear." My Review: Tom Angleberger is a funny man. My eldest (then 13) fought over who would read The Strange Case of Origami Yoda first. (He won). Horton Halfpott is very different in style and subject matter from Yoda, but has the same spirit of inventiveness and clever use of language. In another similarity with the afore-mentioned Incorrigibles, this novel has a wry and omniscient narrator, a vast cast of characters, short and speedy chapters, and fun illustrations by the author himself. In short: it's a ROMP! 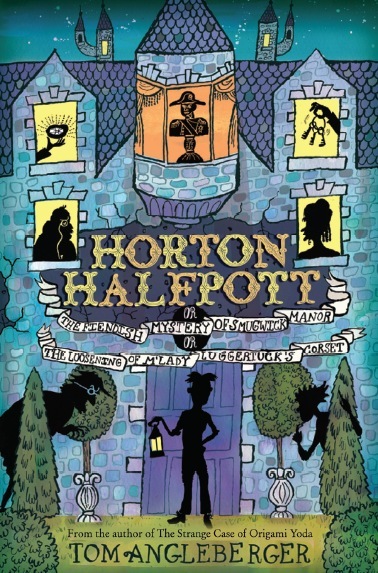 If your middle grade reader likes a not too demanding funny bone tickle, Horton Halfpott would be a most excellent choice. H.R.H. Shannon has been in New Orleans all week. (I'm looking forward to her dispatches from ALA. Shenanigans, surely!) I'm not sure if she's doing all the linking at her blog this week. If not, you can find other MMGMers on my sidebar. Three siblings - India, Finn, and Mouse - have less than forty-eight hours to pack up all their belongings and fly, without Mom, to their uncle Red's in Colorado, after they lose their house to foreclosure. But when they land, a mysterious driver meets them at the airport, and he's never heard of Uncle Red. Like Dorothy in Oz, they find themselves in a place they've never ...moreThree siblings - India, Finn, and Mouse - have less than forty-eight hours to pack up all their belongings and fly, without Mom, to their uncle Red's in Colorado, after they lose their house to foreclosure. But when they land, a mysterious driver meets them at the airport, and he's never heard of Uncle Red. Like Dorothy in Oz, they find themselves in a place they've never heard of, with no idea of how to get home, and time is running out. Opening Line: You have to wait for good things to happen--wait and wait and work so hard--but bad things occur out of the blue, like fire alarms triggered in the dead of night, blaring randomly, a shock of sound, a chatter of current from which there is no turning back." My Review: Confession time. I haven't read Gennifer Choldenko's Al Capone books (although I have been to Alcatraz. Does that redeem me?) I know, I know: just what kind of Middle Grade Mafioso am I, really? But this cover looked alluringly shiny, so I snapped it up. The first thing you have to know: Choldenko is a great writer. The opening line, quoted above, is lyrical--then we dive into a narrative which features not one, not two, but three first person narrators. There's 14-year-old India, who's got the sort of snotty attitude one might expect from a kid that age (I know of which I speak!) Her brother, 12-year-old Finn, is a thinker--and a little bit invisible to those around him. Little sister Mouse, all of six, is a bit of a savant, big on the solar system, and with an imaginary friend called Bing... but is he really imaginary? (Cue eerie music here). I found I couldn't put this book down. 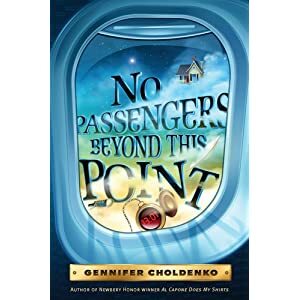 5th graders on would love this, and there would be plenty to talk about, especially how the adventure changes the children in subtle and not-so-subtle ways. And the ending turns everything on its head. If you're a reader, I bet you'll be carried away by the narrative's sheer drive. If you're a writer, I urge you to study this as a classic example of how multiple 1st POV works. Don Vito left yesterday for his annual hols to Sicily. Not that it's been quiet here at the MGM, mind you. Because no sooner had the Don's plane swept off into the skies, then the schoolhouse doors opened and my boys came spilling out, yelling and hollering. In an effort to protect my sanity and my novel-writing time, and with the Don no longer breathing down my neck, I'm changing my blog schedule over at the main blog. 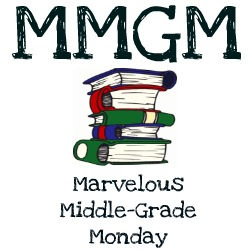 I'll be there on Tuesdays and Fridays, and will continue to post here for Marvelous Middle Grade Monday. This schedule takes effect this minute! And in case you missed it, I'm giving away a Lands' End Polo shirt over at my other blog. You can enter HERE. 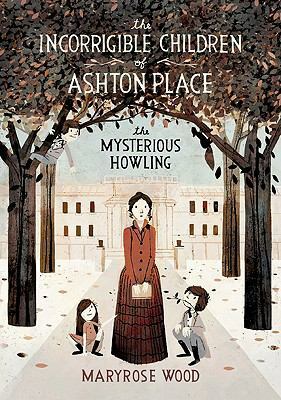 The Incorrigible Children of Ashton Place: The Mysterious Howling by Maryrose Wood. I'm coming out and saying this upfront: I LOVE THIS NOVEL! In England (and in some other countries as well), the day after Christmas is called Boxing Day. Nowadays Boxing Day is the day in which stores put all their merchandize on sale, thus giving exhausted and bankrupt shoppers the chance to stand in line for hours in hopes of saving ten percent on a new microwave oven, which, presumably, would come in a box. In Miss Penelope Lumley's day it was the occasion for small boxes of holiday presents to be distributed to the servants, and that is where the name "Boxing Day" originated. (The bold bits are my pointing out how this kind of humor works--juxtaposing exhausted and bankrupt with the supposed excitement of standing around for a small savings on something mundane. It's in the details ("ten percent on a microwave oven"). The story is sort of Jane Eyreish. Young Penelope Lumley--she's fifteen--is plucked from "The Swanburne Academy for Poor Bright Females" to be the governess to a trio of "incorrigible" children who appear to have been raised by wolves and are now in the keep of Lord Fredrick Ashton, and his new bride Lady Constance. This is book 1 in a series. I immediately went out to get Book 2. It would be a great read-aloud (isn't anything in which one has to employ an English accent?) and would appeal to those readers who devoured Lemony Snicket and other such witty works. Here are some other MMGM bloggers with their reviews for this week. Check 'em out! Barbara Watson continues her special MMGMM summer series by spotlighting THE MOSTLY TRUE STORY OF JACK. Click HERE to see what she thinks. -Joanne Fritz is highlighting SECOND FIDDLE. Click HERE to read her thoughts. -Shannon O'Donnell always has fabulous MG love going on at her blog on Mondays. Click HERE to see what she has going on today. And then, there's always the Ringleader of MMGM, Shannon Messenger. She's reviewing book one of the Pendragon series on her blog today. Plus she has a GIVEAWAY HERE. I think you'll agree with me that a phalanx of dark limos wending their way up a driveway is never a good sign. I mean, the Godfather is usually quite content nowadays to Skype. Why he would travel 3000 miles to pay a personal visit is beyond me. I have to admit my first thought was that I was going to be fired as a Middle Grade Mafioso. (And when I say fired, I don't mean "sacked, let go, and made redundant." I mean TERMINATED. After her brother, sister, and father die in a plane crash, Daralynn Oakland receives 237 dolls from well-wishers, resulting in her nickname: Dolly. But dolls are little comfort to a twelve-year-old girl whose world is rocked by the dramatic changes in her life, including her angry, grieving mother’s new job as a hairstylist at the local funeral home. Dolly gets a job, too, where she accidentally invents a fashionable new haircut. But her real work begins when a crematorium comes to town, and someone has to save a dying business, solve a burning mystery, and resuscitate the broken hearts in Digginsville, Missouri, population 402. Opening line: I'm alive today because I was grounded. Maybe that seems odd to you, but it's true. What a great start! I'm immediately wanting to know why the narrator's grounding saved her life--and she immediately tells me in the next paragraph: "I was grounded by Mother for going fishing at Doc Lake without her permission. That's the only reason I wasn't in Daddy's plane when it crashed and killed him, my brother, and my little sister." Hooked? I certainly was. Because I knew at once that I was in the confident hands of a good storyteller. The narrator, Daralynn Oakland, is clever, sassy, and very much her own person. But it's a tall order to cope with the death of so many members of her family. Worse, her mother seems to have died emotionally--or at least the only emotion she is able to display is anger. Fortunately, Daralynn is surrounded by loving adults, among them her flamboyant aunt Josie, who runs a home for elderly gentlemen and her grandmother, Mamaw, who is slowly losing her grip on reality but can come out with nuggets of wisdom. For her part, Daralynn helps her mother to survive, both financially and emotionally, and in the end saves the town from being fleeced by a flim-flam merchant. She goes from being grounded (punished) to grounded (having roots)--a theme stated explicitly in both the novel and on the cover art. I loved the style and the story. There were a couple of unusual facets for a middle grade novel--mainly that Daralynn doesn't interact with many children of her own age. Also, the major theme of the novel is how to journey through grief and come out changed. In its exploration of grief, it reminds me a little of Suzanne La Fleur's Love, Aubrey. This story is most likely to be enjoyed by those I've heard referred to as "tender-hearted readers." I would definitely read more of Kate Klise! Here are my compadres in this week's MMGM. Check 'em out too! Shannon O'Donnell always has an awesome MMGM recommendation. Click HERE to see what she's featuring this week. -Barbara Watson is doing a special summer of MMGMMs (no--that extra "M" isn't a typo) and she's starting by highlighting THE REMARKABLE AND VERY TRUE STORY OF LUCY & SNOWCAP--and has a GIVEAWAY! Click HERE to see what she thinks. -Aly Beecher is featuring HOW THEY CROAKED. Click HERE to read her review. Myrna Foster is spotlighting THE UNOFFICIAL HARRY POTTER COOKBOOK. Click HERE to read her review. -Deb Marshall is featuring GOSSIP FROM THE GIRLS' ROOM. Click HERE to read her review. And, OF COURSE, the fearless originator of MMGM, Shannon Messenger, who reviews CHARLIE JOE JACKSON'S GUIDE TO NOT READING plus a GIVEAWAY, HERE.